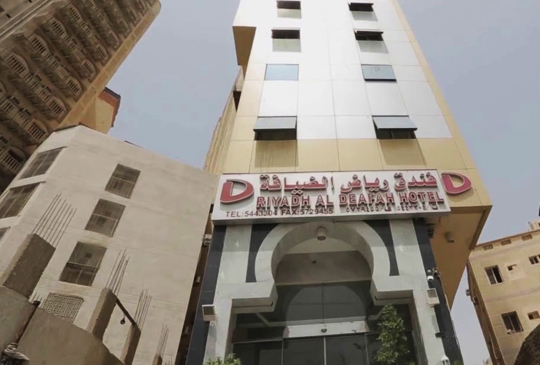 Set in Makkah, 1,000 m from Masjid Al Haram, Riyadh Al Diyafah Hotel boasts a restaurant and free WiFi.Each room at this hotel is air conditioned and features a flat-screen TV with satellite channels. Certain units have a seating area where you can relax. Each room is equipped with a private bathroom.You will find a 24-hour front desk at the property.Abraj Al Bait is 1.7 km from Riyadh Al Deafah Hotel, while Safwah tower is 1.7 km from the property. The nearest airport is King Abdulaziz International Airport, 74 km from Riyadh Al Diyafah Hotel. Saraya Taba Hotel is located within 2 minutes’ walking distance from Al-Masjid Al-Nabawi in Madinah. There is a 24-hour front desk, a safety deposit box, and a restaurant offering room service. Free Wi-Fi is available in public areas.The rooms are air-conditioned and feature a flat-screen TV, a fridge, and a tea/coffee maker. Wake up service is available as well. Some rooms have a view of the masjid.The airport is 15 km from Saraya Taba Hotel.This is our guests’ favourite part of Al Madinah, according to independent reviews.This property also has one of the best-rated locations in Al Madinah! Guests are happier about it compared to other properties in the area.Couples particularly like the location — they rated it 8.3 for a two-person trip.This property is also rated for the best value in Al Madinah! Guests are getting more for their money when compared to other properties in this city.We speak your language!